Typ AU or AZU. That’s the code Citroën gave this 2CV Fourgonnette. And the Fourgonnette, of course, means it was the transporter, the Van you will, of the 2CV-family. I should say 2CV/3CV-family as the Fourgonnette even was available as a 20cm longer edition called 3CV AK. Citroën “just” cut the body in half and added a big box made from corrugated metal. And although pretty spacious it wasn’t really capable of hauling like a mad man: the maximum load was 250 kgs. And that may have something to do with the engine initially (AU) mounted: A 375cc flat twin putting out 9hp. From 1954 and on the AZU was available (the AU ceased to exist in 1956) with the way more powerful (12hp!) 425cc engine. This one we recognize as a AZU from between 1961 and 1963. Because from 1961 the wheels were plain white instead of the colour of the body (although they appear to be somewhat similar I’m sure it differs) and from 1963 and on the corrugated sheet metal no longer was corrugated from the waist and upwards. The rear-wheels broke of. Both. And this aint no car with rollable wheels (just like that Turbot Rhino I). I thought only the rear right wheel fell of but moving house probably persuaded the other on to join my torture as well. So another job for me to do (next to the lights of the Melkus), repair it’s wheels. Nothing a dot of Revell Contacta won’t be able to fix though, seems to be a nice straight crack. This is a 1/43 by Atlas as well. Both Spirou and Fantasio are in the car so it’s even a bigger disappointment those wheels don’t turn at all. This one needs to get a panning shot with all those luggage on it’s roof. It’s just a pity there’s clearly no engine whatsoever underneath that bonnet: you see right through it’s wheelarches! I know it’s a flat-engine but there should definitely be some stuff there. 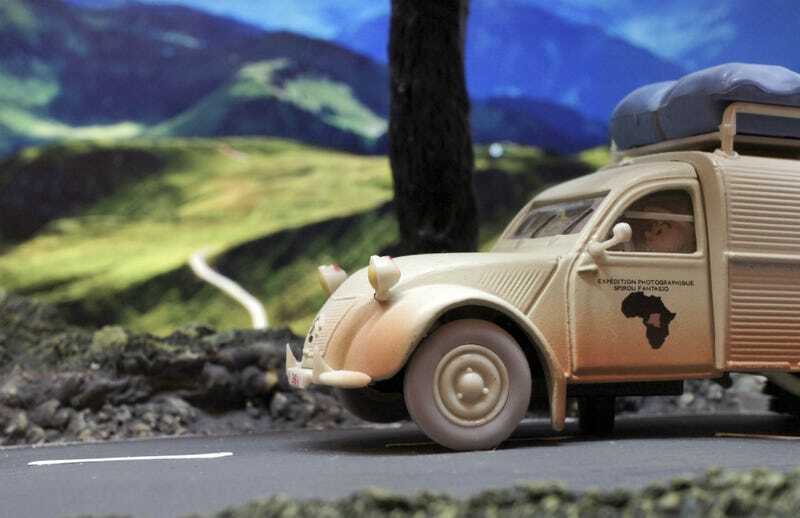 So what ended the 2CV Fourgonnette? It was Citroën’s own Acadyane that pushed the 2CV Fourgonnette in it’s grave, there simply wasn’t enough space for both of these on the French small transporter market. For the normal 2cv did wasn’t the case: the Dyane stopped being built way before Citroën stopped making the 2CV. Looking at this one I’m not so sure if the repair is done quickly though. First I’m going to read the story “Le Gorille a bonne mine“ (the official English title is Gorilla’s in Good Shape) as it’s been way too long ago since I read that one. Bonne week-end!